We have developed the EJX910 multivariable transmitter, an all-in-one instrument that integrates the functions of a differential pressure transmitter, a pressure gauge, a thermometer and a flow computer, while featuring high performance and space-saving design. The transmitter employs a unique flow rate calculation method, achieving a mass flow calculation cycle of 100 milliseconds. By adopting a Reynolds number compensation algorithm, etc., all flow calculation parameters were optimized and a mass flow accuracy rate as high as 1% was achieved. Furthermore, EJX910 complies with a wide range of primary devices, including orifices, nozzles and venturi tubes, and various types of fluid, including general fluids, steam tables, and natural gas. 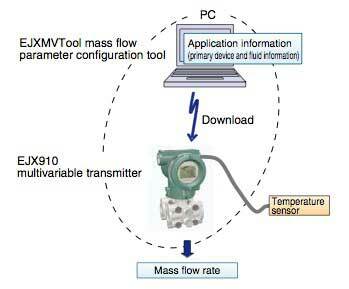 Application information, such as the primary devices and fluid data required for mass flow calculation, is input using the EJXMVTool, a mass flow parameter configuration tool that runs on a PC and is downloaded to the transmitter by means of field communication. A field test performed on a British natural gas test line showed an excellent mass flow measurement accuracy of 1%. When evaluating mass flow rates using a primary device such as an orifice or nozzle in a differential pressure flow meter in order to make fluid density compensations, the upstream pressure (static pressure) and fluid temperature are measured in addition to the output of a regular differential pressure transmitter. In the past in such cases, a differential pressure transmitter, a pressure transmitter, a temperature converter and a flow computer were all separately required. The DPharp EJX series of differential pressure transmitters developed by Yokogawa in 2004, can simultaneously measure both differential pressure and static pressure using an advanced form of silicon resonant sensors that comprise the multi-sensing function. Recently, we have developed the EJX910 multivariable transmitter as a new model that incorporates this series' functions to full advantage. The EJX910 integrates the functions of a differential pressure gauge, a pressure gauge, a thermometer, and a flow computer into a single instrument, thereby achieving high space efficiency and multifunctionality. A Reynolds number compensation algorithm and other means have been adopted for the mass flow rate calculation of this transmitter to optimize all flow rate calculation parameters and achieve high-precision mass flow rate measurement. In this paper, we will focus on the functions related to mass flow rate calculation, one of the features a multivariable transmitter has to offer. Figure 1 shows an external view of the EJX910. 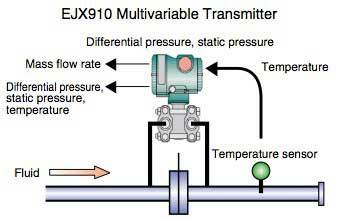 The EJX910 multivariable transmitter serves as a differential pressure gauge, a pressure gauge, and a thermometer (with an external temperature sensor). In addition to this multifunctionality, the fluid density compensation function provided by the transmitter itself and the PC-installed EJXMVTool's mass flow parameter configuration tool enable high-speed, high-precision mass flow rate measurement. The EJX910 supports a number of flow rate standards and a variety of fluid types as target applications. Moreover, the EJX910 can be applied to integrated flow rate measurement and various diagnoses that use many process variables (differential pressure, static pressure, temperature, etc.). Figure 2 shows an example of measuring mass flow rates from orifices and temperature sensors installed in a process. The EJX910 measures the difference between the upstream and downstream pressures of the orifice placed in the process, the upstream static pressure and the fluid temperature. Then the transmitter calculates the mass flow rate from these measured values. Figure 3 shows a configuration of a mass flow rate measurement system. 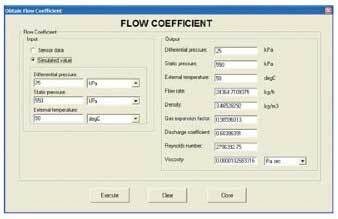 Application information necessary for flow rate calculations (primary device and fluid information) is input using the EJXMVTool mass flow parameter configuration tool running on a PC. This information is then converted into parameters that can be perceived by the transmitter and downloaded to the transmitter by means of field communication. 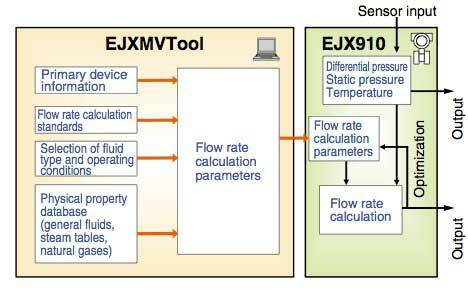 Figure 4 shows a block diagram of a mass flow rate measurement system comprising the EJX910 and EJXMVTool. Differential pressure, static pressure and temperature measured by the EJX910 can be directly output as process variables. The system performs fluid density compensation calculations according to the following equation to determine the mass flow rate. For this purpose the system employs a unique method of calculation that minimizes the transmitter's calculation load, and achieves a flow rate calculation cycle of 100 milliseconds. 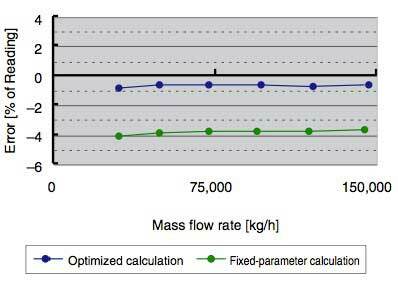 In a simplified method of flow rate calculation, the parameters in Equation (1) are treated as fixed values, resulting in large mass flow rate calculation errors as shown in Figure 5. The EJX910 performs optimized calculations in real time using dynamically changing parameters, thereby realizing a high flow rate accuracy of 1%. More specifically, Reynolds number corrections are made to the discharge coefficient (C) according to changing measured values. The gas expansion correction factor (ε) is corrected against the effects of adiabatic expansion of gases. In addition, the fluid density (ρ1) is corrected for static pressure and temperature variations. The transmitter supports 12 types of general fluids and employs the DIPPR® physical property database widely used around the world. The transmitter supports IAPWS-IF97 Water and Steam (1997), the standard for steam tables used in each country (e.g., JSME and ASME). User-maintained physical property values can be incorporated in the transmitter. 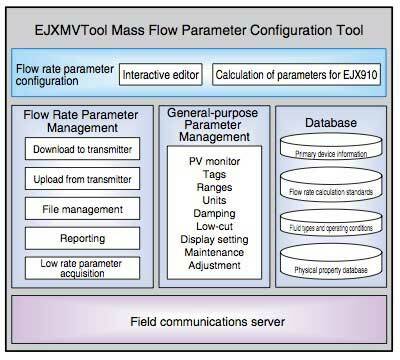 Figure 6 shows the structure of the EJXMVTool mass flow parameter configuration tool used to set mass flow rate application information. This function comprises interactive graphic screens used to configure the flow rate calculation parameters shown in Equation (1), including application information such as primary devices and fluid types. Parameters can be configured easily as this function automatically converts the parameters to the transmitter's format. This function saves flow rate parameters to a file, uploads and downloads these files to and from the transmitter, obtains results of parameter calculation by the transmitter, and outputs reports. This function sets general-purpose parameters such as ranges and units. 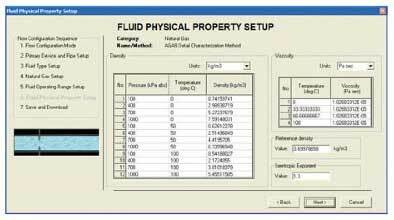 The software contains a database of physical properties necessary to calculate fluid density and viscosity. For easy compliance with various methods of field communication, the software incorporates the same field communications server used in the PRM (Plant Resource Manager) field device management package. As explained below, the operating screens of EJXMVTool have been designed in association with specific applications. As shown in Figure 7, this screen is used to set the diameter of an orifice or other primary device, the pipe diameter and the materials. This screen is used to select the fluid type to be measured. This screen is used to set the composition information of a natural gas. This screen is used to specify fluid pressure and temperature range, which are necessary to calculate density or other data items. As shown in Figure 8, this screen is used to verify data to set fluid density and viscosity. This screen can be customized. This screen is used to convert user-input primary device information and fluid information into a transmitter-specific format and then download that information to the transmitter. This screen is used to verify the results of simulating mass flow calculations by the transmitter with the sensor inputs in Figure 9 applied as simulated inputs, in order to predetermine the results of applying the downloaded information. This screen is used to verify the results of flow rate calculation under actual plant operation with the respective sensor inputs in Figure 9 actually applied. 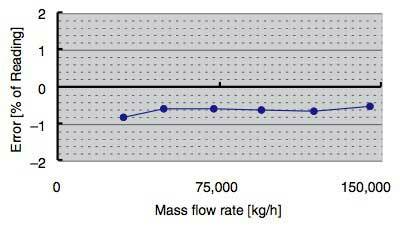 Figure 10 shows the results of an actual flow test performed on a British natural gas test line. The test results show a mass flow rate measurement accuracy level as excellent as 1%. Users have also highly evaluated the EJX910 in other actual flow tests. In future we intend to further accumulate experience in mass flow rate measurement using multivariable transmitters, while broadening the range of applications to encompass an even greater variety of primary devices and fluids. In addition to mass flow rate measurement, we will further develop fluid level measurement and multivariable measurement-based process diagnosis. 'DPharp', 'EJXMVTool' and 'PRM' are registered trademarks of Yokogawa Electric Corporation. All other product names, including software names, appearing in this document are the trademarks or registered trademarks of their respective companies or groups.